The great screwball comedies of the ‘30s and ‘40s from acclaimed directors like Wyler, Hawks, Lubitsch, and Sturges are always crowd pleasers. These are movies chock full of star power, snappy dialogue, stunning sets, and buckets of style. Sometimes, I fear, what is not to like is when mean-spirited revenge is played for comedy and a supposedly “happy ending” of wedded bliss is sure to be doomed because the bride and groom will, in no way, ever operate on the same level and with any sense of trust. Call me a poop, but for that reason, I just can’t put THE LADY EVE (1941) by Preston Sturges at the top of my list of favorite comedies from that era. 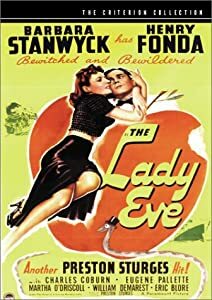 You’ll get no argument from me that THE LADY EVE is indeed a funny and clever film with laugh-out-loud lines so full of double entendre that they’re actually shocking. I can watch selected scenes from this movie over and over and over and never stop being entertained by their hilarity. I have a friend who often waxes on how THE LADY EVE is one of the most brilliant comedies of all, and I’m just using this space to put in my two cents that it’s a bit depressing as well. Barbara Stanwyck is gorgeous as Jean, a manipulative con artist, and Henry Fonda is the handsome but bumbling Charles Pike (aka “Hopsie”) as her love interest — although you can’t help but wonder how the scenes would have sounded and looked with Hepburn and Grant in charge. Co-stars William Demarest as Fonda’s right-hand man is delightful, and Charles Coburn as Stanwyck’s father is the lovable criminal you can’t help but like. On a trans-Atlantic crossing, Stanwyck plays the ultimate “cruiser,” setting her sights on Fonda when she discovers he is an heir to a beer fortune—and even better, he is completely clueless to feminine and cardsharp wiles. Within minutes of their first meeting, Stanywck gets him to her room and actually has him picking out her shoes and falling on his knees to slip them on for her. Who is this guy? And who in the world is this dame? She is lusty and lovely and not to be trusted. You feel a bit sorry for Fonda’s Hopsie character, but the again, maybe not. Once Stanwyck’s countenance goes cold and her wheels start turning on an “I’ll get you” path, the movie loses its laugh power. I’m not rooting for her anymore. I’m annoyed by her nasty spirit and smug self-assuredness that she’s in a fight to win, in the name of winning alone, not in the name of finding love. If you’re watching THE LADY EVE at home, this is the point in the movie when might want to get up, pour yourself a glass of wine, go to the bathroom, make a list of things to do for the next day. Keep within earshot to catch a few clever lines however. And when you hear froggy-voiced Eugene Palette (playing Fonda’s father) banging on the table demanding that someone feed him, settle back in. He steals the show. The movie regains its momentum here and as we watch the kitchen staff get ready for a dinner party—a brilliant series of scenes. This is joyful moviemaking at its best. But then the devious Stanwyck walks in, and the spirit of fun dissolves. A lot of time, and I mean A LOT of time goes by as Stanwyck lies, postures, and poses, and we head to the inevitable conclusion: Hopsie will stay clueless and Stanwyck will get her man. And no one, in the end, will be the happier for it. You do a good job of explaining why I was lukewarm on this movie the one time I saw it. Thanks! You made my day. I figured I would get a comment or two about how I wrong I am about it!